Pop sensations Jedward have been sporting new coloured contact lenses as they promote the latest game from Nintendo. The former X Factor contestants have signed a deal to promote the new Square Enix game Dragon Quest IX for the Nintendo DS, an agreement which involves dying their hair and wearing coloured contact lenses to look like characters from the game. Earlier this week, fans who arrived in London's Covent Garden to see the duo and purchased a copy of the game were presented with signed merchandise. 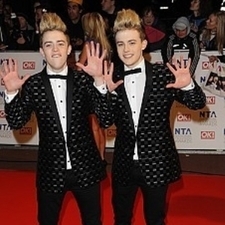 During the event, Edward sported dyed pink hair and wore blue contact lenses, while John's famous quiff was turned blue. Recently, actor Robert Pattinson revealed how the coloured contact lenses required to play Edward Cullen in the Twilight saga help him to get into character. According to the 24-year-old, they assist with transforming into the brooding vampire he has played in Twilight, New Moon and Eclipse.